Kerala State Legislative Assembly Building Assembly Building. Just like Kerala Legislature, the Legislative Assembly building also has a great historical background. The working of Travancore Legislative Assembly began on August 23, 1888 with its inaugural meeting at Diwan's room in the Secretariat building. The meeting of Legislative Council with eight members was presided over by the Divan. The meeting place got changed when the first meeting of Sri Moolam Popular Assembly with one hundred members was held at VJT hall on October 22, 1904. Later authorities felt the need for a new building with more facilities. Activities in this direction started when the Viceroy Freeman Thomas laid the foundation stone for the Legislative Assembly building on December 12, 1933. This building was part of the government secretariat. When Kerala State was formed, there was a gradual increase in the number of Legislative assembly members. It became one hundred twenty six, which later on got increased to one hundred forty one. Depth of Legislative assembly activities and increase in the number of members made the authorities think of a separate building for legislative assembly. Even though the discussions on this started in 1970, the subject got heated up during the term of fifth Kerala Legislative Assembly. Government accepted the proposal of the ministry to construct assembly building in the region between Vikasbhavan and M.L.A hostel and gave sanction on September 19, 1978. The construction of Legislative Assembly complex began on June 4, 1979 when the President of India Dr. Neelam Sanjeeva Reddy laid the foundation stone. The first stage was the inauguration of Administrative block by Balram Thakar, Loksabha Speaker of the time. Legislative Assembly building, the construction of which started on 11 august 1986, was inaugurated on 22 May 1998 by K.R. Narayanan. The Assembly complex in an eleven acre plot has an area of 61760 sq.ms. The administrative block, which has an area of 19180 sq.ms., consists of conference halls, dining hall, offices of committee chairmen, parliamentary party offices, Legislative Assembly library and canteen excluding the Legislative assembly secretariat office. Legislative assembly building with an area of 42583 sq.ms., an eight storey building with three underground storeys, is having octagonal shape. Assembly hall in the first floor with a height of 29m and an area of 1340 sq.ms. provides seating facility for one hundred eighty six people. In addition to this it provides additional seating facility of about 1438 seats for chief guests, media persons, visitors and other officials along with rest rooms. Assembly hall gives access to most modern technology like digital conference network that enable translation to four languages at the same time, electronic display boards on either side of the Speaker's dais. Lighting arrangements include one hundred seventy halogen lights around the roof of Assembly building. Automatic fire alarm, Springer system, C.C.T.V. Surveillances system and eight elevatots are all specialties of this building. 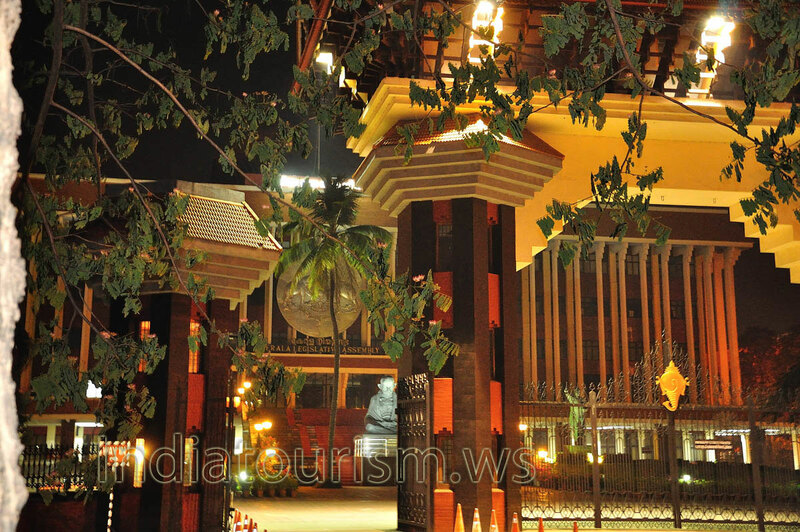 The main entrance of Legislative assembly building and the kumbhagopuram (cupola) on top reminds Kerala sculptures. The main entrance made of cast iron will be opened on special occasions. On 3rd September 2005, Prime Minister Dr. Manmohan Singh unveiled the statues of Mahatma Gandhi (father of the nation), Pandit Jawaharlal Nehru (first prime minister) and Dr. B.R. Ambedkar (architect of Indian Constitution) in front of Legislative Assembly building. A Museum for Legislature highlighting the various stages in the people's representation was formally inaugurated on May 5, 2006.